First, I want to say thank you to all the beautiful brides-to-be that attended the Bridal Extraganza! We had fantastic experience at the Grand America Hotel and it was fun talking with everyone that stopped by the booth. We are excited at the prospect of helping create some of the amazing bridal gown designs that were discussed with us throughout the day. If you haven't purchased your gown yet because you just can't find exactly what you want, call us for a consultation because we can help you create it! Well I don't know if the groundhog saw its shadow or not, or when Spring will be here, but it is feeling like we are on the other side of winter. My imagination lends itself to lighter jackets, bright colors and fresh styles. To get us started, we decided to use a beautiful plum vegan leather and sew a Moto jacket! 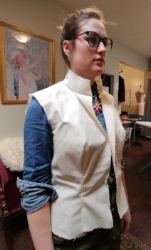 We always start every project sewing a muslin version to check the fit. We will adjust the princessline and collar at the front. Now for the Vegan leather or "Pleather". It has a great texture and soft hand perfect for this jacket! All the corrections from the muslin fitting were transferred to the pattern so let the cutting begin! The fabric has no grain but it does have some stretch so the cutting layout was planned accordingly for cross-body stretch . Also, the back yoke piece will be cut from a wool boucle' for some design interest. Construction was a bit tricky. Pressing the vegan leather with too much heat could melt it! We used some steam, the clapper and rubber cement to open seam allowance. Top stitching was used where desirable. The curves on the princess seams were hard to ease-in mainly because this fabric needle marks and so you get one chance to make it happen. The wool boucle' was quilted to silk organza to give it the proper support before being sewn into the jacket. Lining is cut and sewn for the jacket. We used an insulated rayon Bemberg lining to keep warm. The sleeve lining is joined at the hem first then basted to the armsye of the sleeve. The main body lining is also sewn to the hem edge first to give a clean, professional hem then it will be hand sewn at the collar. Separating zip in and now it just the finishing details. Love this jacket!! Exciting news! Tissu Fine Fabrics & Design Gallery will be participating in the Bridal Extravaganza at Grand America hotel, 555 South Main St., Salt Lake City, UT. The date is Saturday January 20th, 2018 from 11 am to 5:30 pm. This is the perfect opportunity for brides~ to~ be to come and investigate some amazing wedding planning vendors and get ready for that special day! Come and see us at Booth number 53 where we will be giving away One hour Wedding Dress Consultations. Admission is $5.00 for brides and $ 8.00 for non-brides. We are so excited to start sharing our dress making experiences and some of our favorite sewing tips with all of you! Last year we had some amazing projects including fabulous wedding gowns, beautiful mother of the bride and mother of the groom ensembles and some fun vintage-style ready-to-wear outfits. I really can't say I had a favorite project. All of them were so exciting and unique! Some of the highlights that stand out for me were new techniques I learned in conjunction with projects. Dying different fabrics was one of these! We made an amazing red wedding dress and had to dye the lace to match. There wasn't one dye color that would work and the fiber content in the lace was mixed, rayon and nylon. And so the experiments began! I had to use three different shades of red dye from "Dharma Trading" (the best) and two choices from "Dylon". I used different measured combinations amounts of the dye and water ratios and kept track of the time in the dye bath. The results were fantastic! It taught me so much about the process for dying and someday I hope to attend a workshop. Thank you to our lovely bride Jennifer for this opportunity. LOVE this dress! !